Research has shown that the development of a child during his/her first three years has a significant effect on future success; and intervention for any developmental delays during these years can have a substantial positive impact. Pediatrics Plus is a participating provider of First Connections. If an infant or toddler is referred for therapy services or family intervention with Pediatrics Plus, our referral managers will walk interested families through the process of enrolling into the program, evaluate the child and family for eligibility, and provide any services for which the child and family qualify. First Connections is a program that provides developmental services for infants and toddlers and intervention for their families. 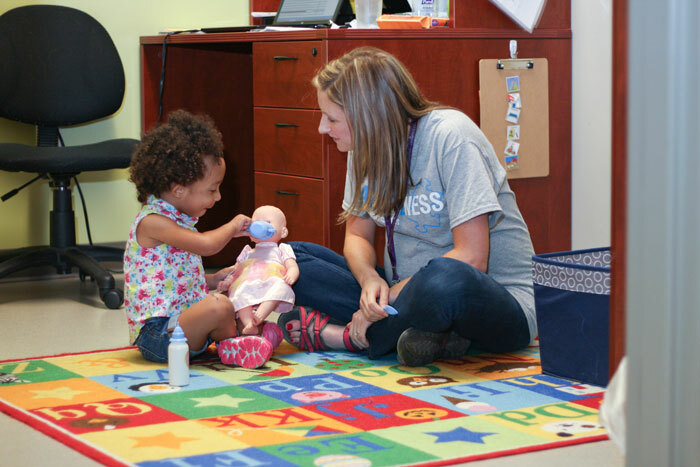 The First Connections Program partners with families to help remediate developmental delays, preferrably in a natural and routines based environment, in order to create the best foundation possible for infants and toddlers. The First Connections Program is a federally funded program provided to states through Part C of the Individuals With Disabilities Education Act. (IDEA) The Arkansas Department of Human Services (DHS) is the Lead Agency for the Program. The Division of Developmental Disabilities Services (DDS) is the division within DHS, which has administrative responsibility for implementation of the program. Have a developmental delay in one or more areas of development. This delay must be 25% or more of their chronological age. Have a medical diagnosis that has a high probability of resulting in a developmental delay. What can the program do to help?